Salvia is endemic to the Sierra Madre Mountains in Oaxaca, Mexico. In this region it is used by Mazatec curanderos and curanderas in different rituals. The plant is mostly used when these shamans felt they needed to discover the cause of a patient’s illness in the supernatural world. The shaman entered a visionary trance that allowed him to see what steps have to be taken to cure the patient. This is still a common usage of salvia under the present generation of Mazatec Indians. The plant is also used for prediction, meditation and the search for the divine. Little is known about the usage of Salvia divinorum before its Western “discovery” in the 20th century. It’s probably been in usage for hundreds of years, but it was only when R. Gordon Wasson, the famous botanist who also introduced psilocybe mushrooms to the Western world, brought back a specimen in the 1960’s that the plant became an object of scientific research. However, it remained an obscure plant until the 1990’s, when Daniel Siebert began his research on the plant. Nowadays, salvia is widely known and sold in many (web)shops. But, there is still a lot of research to be done into the chemistry and effects of salvia. Modern research into Salvia divinorum started in the 1930’s. Salvia divinorum was first recorded in Western literature in 1939 by Jean Basset Johnson, who did research on the use of hallucinogenic mushroom in Mexico. He saw that the Mazatec Indians used the leaves of “Hierba Maria” to induce visions. 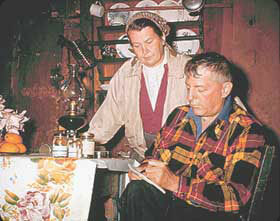 R. Gordon Wasson continued research in the 1950’s and confirmed the psychoactivity of salvia. Together with Albert Hofmann, the discoverer of LSD, and Roberto G. Weitlaner, he was the first to bring back live specimens back to the west. They sent one of those specimens to Harvard University in 1962, where it was analyzed by Carl Epling. It remains unclear how long salvia use dates back among the native inhabitants of Mexico. It is suggested that the plant was introduced after the conquest of the new world. The evidence to support this is that the Mazatecs do not have an indigenous name for the plantl: they use names referring to Mary or sheep herding(“Hierba Maria” or “ska Maria Pastora”), while both christianity and sheep were introduced by the Spanish. Moreover, the Mazatecs have a method of consumption that is quite inefficient, which suggests that they are not aware of the enormous psychoactive potency. However, R. Gordon Wasson, and others after him, suggested that Salvia divinorum could possibly be the same plant the Aztecs called “Pipiltzintzintli” (literally “the purest little prince”), , which was described by a Spanish author in the 17th century. In the 1980’s researcher J. Valdés III continued to investigate the history of salvia prior to Wasson’s “discovery”. He suggests that “Pipiltzintzintli” is most likely cannabis, not salvia.